The designers at Pop Chart Lab created a beautiful infographic – otherwise known as a graphic with lots of information on it – all about significant architectural structures from around the world. It looks like a bunch of small blueprint drawings of each building, and the significant facts about each are listed too, like location, height and year built. 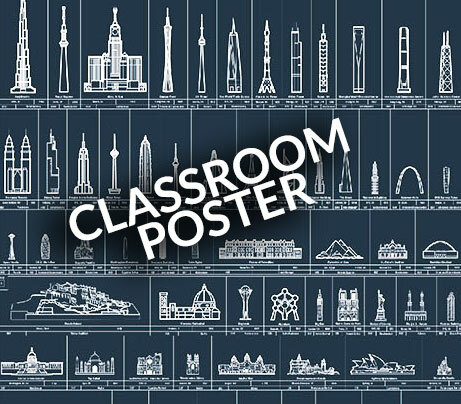 The poster is not free – it costs $29.00 – but it would be a good foundation for an investigation into world architecture for teachers. 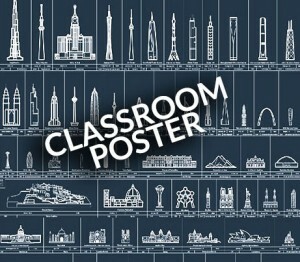 Students could look at the poster, select a structure and do a research project. Students could also try to find other works from the same location and draw a timeline, or they could try to build or draw the structure from other images they find on the web. There are a lot of ways to stimulate interest in our built environment. Here is just one poster-sized way to begin. It is available at Pop Chart Lab. BuildIT! Exhibit at the Betts Again!